The RX100 was instrumental in forging the high-end point and shoot category of digital cameras when it debuted in 2012. Last year's Mark II version was a minor spec bump, but the new RX100 Mark III has some startling features you'd ever expect from a camera so small. At first glance, the $800 RX100 Mark III—available in June—looks just like its forebears. In size and shape it's almost identical. But below the surface are a couple of key changes that set it apart in a big way. The first is a 1.44 million dot OLED viewfinder that pops up from the camera's top panel, a feature Sony says users were clamoring for. Unfortunately the additional hardware moves the pop-up flash to the center of the camera's body, which displaces the hot shoe completely and leaves no option for connecting a microphone or external flash. But at least bright sunlight will no longer hinder your composition! The other most prominent change to the RX100 is the lens. Where prior versions had a f/1.8-4.9 28-100mm (equivalent) zoom, the Mark III lens is f/1.8-2.8 24-70mm. That means you are getting a brighter lens throughout the zoom range at the expense of, well, zoom range. This is a smart move by Sony, as most shooters probably value larger aperture over a slightly longer zoom. Other changes found in the RX100 Mark III include a 180 degree tilt-able LCD for the selfie-inclined, and a really cool video feature—full pixel readout just like the RX10, which has terrific video quality. That means video footage on the Mark III won't be plagued by aliasing and ugly moire patterns. Rejoice! And that's not all. The video codec has been upgraded to the new XAVC-S codec, recording Full HD at 50 Mb/s! That should noticeably increase video quality, as well as support frame rates up to 120 fps. This is all thanks to the Bionz X processor, which Sony has been putting in all its new cameras this year. Another bonus for video and photo users alike is the built in three-step ND filter for controlling your depth-of-field in bright settings. This makes up for the rather slow maximum shutter speed of 1/2000. Video capabilities like this are going to be a huge boon for filmmakers of all sorts; there's sort of a lack of great options for really small cameras that also shoot great video. The RX100 Mark III will be great for B-roll in tight spaces, for example. However, it is somewhat tragic that there is no way to hook up a mic, which limits the camera's ability to function as complete tool for videomaking. Other specs are largely the same as the Mark II. The same 10 fps continuous shooting, same contrast-detection AF, same battery life at 350 shots using the LCD, same one inch 20 megapixel CMOS sensor. You may be disappointed that the sensor is the same. Unfortunately, it's simply a reality that sensors aren't improving very rapidly at the moment, so you'll have to sit tight with the current technology, which does produce fantastic images! 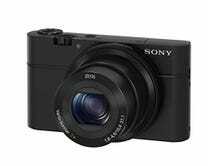 Sony told us that it doesn't see this as a replacement for the RX100 Mark II, or even the original RX100. It sees the three models co-existing, presenting different options and price points to people with different needs. This is kind of a radical approach for a big corporation, but a welcome one. More options is always better. The original RX100 is still a great camera, and can be found for $550 on Amazon, while the RX100 Mark II goes for $750. The Mark III is a whopping $800, but if you don't need an EVF or other enhancements, there are more affordable options waiting in the wings.